Bentonite is a naturally occuring clay material which can be used as a lake and pond liner. Bentonite is a very useful mineral in our society. Usages range from food additives, as a thickener or for enhancing digestion, to sealing lakes and ponds. Bentonite is also used for cat litter, drilling mud in mining, casting in the metal industry, medicines, cosmetics, adhesives, cleansers, detergents, etc., etc. Bentonite is a naturally occurring clay mineral mined largely in Wyoming, Texas, Alabama, and Mississippi as well as many other places throughout the world. There are two main types of bentonite; sodium and calcium. This difference is important to understand when using bentonite for the purpose of pond liners. Because of the potential for ion exchange with the water the wrong mix can prove unsuitable. When using bentonite as a lake or pond liner the right consulation and construction practices should be used. This can mean the difference between a beautiful pond and and an expensive mud pit. This website has been launched to help educate the reader about the common methods of using bentonite as a pond liner. Seepage Control, Inc. has been in the business of lake sealing and building pond liners for over 50 years. We are a proponent and manufacturer of ESS-13, an environmental soil sealant, and have been involved with nearly every type of lining system. Sometimes it is necessary to incorporate or even solely use ESS-13 to create a stable, long lasting pond liner. Click here to learn how to build a pond liner using bentonite. 1. Guyonnet, D., Gaucher, E., Gaboriau, H., Pons C.-H., Clinard, C., Norotte, V. Didier, G. 2005. Geosynthetic clay liner interactions with leachate: correlation between permeability, microstructure and surface chemistry. Journal of Geotechnical Engineering, Vol. 131, page740-749. In areas where the native soil is insufficient Bentonite can help. In many cases ESS-13 can aid the native soil as well. Bentonite can be applied to ponds using a few different methods. Among these are sprinkling, mixing with the native soil, and blanketing. Bentonite can be “sprinkled” into the water near areas suspected of leaking in an effort to seal them off. This is rarely effective because of the high probability that the bentonite will not land in the area of the leak. Bentonite is blended with soil on-site to amend the quality of the soil to reduce water seepage or leaking. In order to determine the amount of bentonite necessary for this method, you will need to have your soil analyzed by a soil lab (typical blend is about 5%-10% by weight bentonite/native soil). Once the analysis is complete, you should receive direction on the percent of bentonite necessary to create a seal. This method has a much higher rate of success than the sprinkling method. Bentonite can also be applied as a blanket over an existing pond surface. Bentonite is typically applied 1" to 4” thick and then covered with a protective layer of soil. Once installed, the entire site will need to be moisturized and compacted. To facilitate a proper dry bentonite application, the pond must be drained, dried out, and kept dry during the construction of the liner. Once the soil has been allowed to dry considerably, the mixing phase can begin. The bentonite is spread over the soil at the specified application rate and then the bentonite/soil combination is uniformly mixed. Large scrapers, dozers and discs can be used in combination to efficiently mix the soil. Once the soil has been well mixed with the bentonite, this combination needs to be hydrated to +- 2% of optimum moisture content and then compacted. Compaction is necessary to reduce the voids in the soil, and help the clay particles lay flatter together. Compaction is usually done with a sheepsfoot vibratory compactor in combination with whatever other heavy equipment is available onsite. It is very important that no more than 6” layers or lifts be constructed at a time. An on-site supervisor is recommended to oversee each phase for a couple of reasons. Primarily, each soil is unique and therefore responds differently to moisturization and compaction. Having someone with experience to be able to observe the soil and its response will save hours of construction time and years of headaches due to a faulty pond liner. Secondly the work can be very tedious and there is a tremendous advantage to having someone on the ground observing changes in soild conditions to assist the equipment operators. Most contractors are used to preparing a site for building construction where there is more grace if the soil is not perfectly prepared. Pond water is much less forgiving, and will quickly find the areas that were inadequately constructed. If you want a pond sealed with sodium bentonite, you will need to have a professional apply the materials for the best results. Contact Seepage Control first if you are considering using bentonite to build your pond liner. We can help you evaluate your soil, your site conditions, and help get your lake off to the right start. The liners that we build also come with a guarantee, which is rare among lake contractors. Seepage Control can incorporate ESS-13 into native soil to create a stable soil liner. Bentonite can be quite costly if your pond not in close "proximity" to a bentonite source. Many times the shipping cost can exceed the cost of the bentonite. If you hire Seepage Control to assist with your lake project we can run soil tests using our proprietary ESS-13 and determine whether we can simply use the native soil with our product to build the liner. Click here to see how ESS-13 may be a suitable choice for lining your lake. This page discusses the alternative or combination treatment of ESS-13 (Environmental Soil Sealant), a proprietary soil sealant for sealing lakes and ponds. 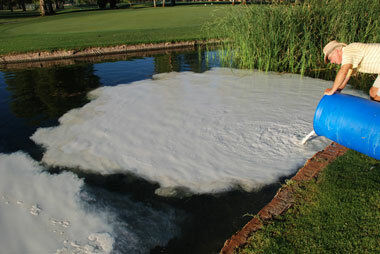 The ESS-13 Waterborne Application is extremely effective for lakes and ponds that are experiencing generalized seepage. Bentonite, on the other hand, is effective for small isolated areas where water is flowing (such as around pipes). Being able to apply ESS-13 to a full body of water is a huge advantage as it is not necessary to know where the seepage is occuring. In addition, with the ESS-13 waterborne, your pond doesn’t need to be emptied. ESS-13 migrates throughout the entire pond covering every square inch of soil and is drawn into those areas where the seepage is occurring. With the ESS-13 Waterborne Application, it is not uncommon to see reductions in the amount of water loss due to seepage of up to 90%, with the results improving with time. The Treated and Compacted application is suitable for new lake construction or lakes that are being completely renovated. 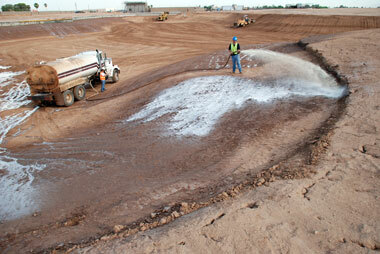 Similar to a bentonite lining system, ESS-13 is mixed into the soil during the construction phase. The advantage over bentonite in this type of treatment is the ease of introduction into the soil as well as the uniformity of the coverage. Because it is a liquid, ESS-13 can be added directly into a water truck, and then introduced into the soil during the moisturizing process. This ensures a much more uniform distribution. The ESS-13 Treated and Compacted Formulation includes a compaction aid which enables the contractor to achieve much higher compaction than with bentonite or native soil alone. Spray-On ESS-13 is also available in a Spray-On Formulation. With this method, the product is simply sprayed directly onto a prepared subgrade. This sprayed layer is then allowed to dry, and a six inch compacted layer is installed as a protective cover. The ESS-13 Spray-On Formulation has been lab proven to be Seepage Control’s most effective application for meeting most state’s requirements for sewage lagoons. For projects requiring an exceptionally low permeability rate, this is the preferred option. As with our bentonite application, a dry application method of ESS-13 includes on-site technical representation during the pond liner construction. A Seepage Control representative is on-site during the entire installation process ensuring that the lining system is installed properly. This technical support enables Seepage Control to guarantee the results. Generally speaking, these options are not available with bentonite alone. The seal obtained with ESS-13 actually improves with time. ESS-13 binds with the soil at the molecular level resulting in a permanent seal. If you would like to pursue more information about ESS-13 please click here to be taken to the Seepage Control, Inc. website. You can also contact us with your pond lining questions. 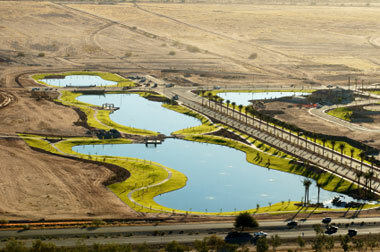 © 2011 Seepage Control, Inc. | www.seepagecontrol.com All Rights Reserved.